Visually and aurally arresting, ENO's most recent stage world premiere 'The gospel according to the other Mary' was an unqualified success. Directed by librettist Peter Sellars (based on Old and New Testament sources and with texts by Dorothy Day, Louise Erdrich, Primo Levi, Rosario Castellanos, June Jordan, Hildegard von Bingen and Rubén Darío) and with music by John Adams this opera parallels Mary Magdalene's and her sister, Martha's, biblical history with that of contemporary lives. The term 'stage world premiere' means that they have tried this out before... notably in March 2013 at the Barbican and before that in 2012 by the Los Angeles Philharmonic Association, who co-commissioned it. In both these cases it was billed as an oratorio – and while it deals with the subject of the Passion of Christ, this stage performance lifted the production to a new plane. Dorothy Day was instrumental in setting up the Catholic Worker Movement and a series of shelters for the homeless. It is her text, written following her second arrest, that provides the powerful opening passage. 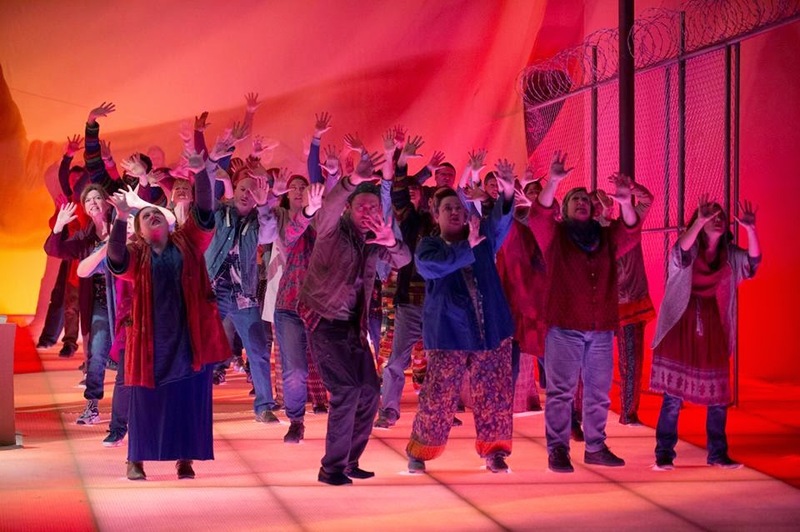 Here Mary Magdalene performed by mezzo-soprano Patricia Bardon is in prison listening to a drug addict screaming through her withdrawal symptoms while the chorus in peasant dress sing “Howl ye, for the day of the Lord is at hand”. On her release she and her sister Martha (Meredith Arwady) set up the hostel that becomes the setting for the biblical events that follow. Both ladies threw themselves into their roles with impressive clarity, diction, emotion and the stylised arm-ography dance routines that peppered the opera and drew all the strands together. The three counter tenors Daniel Bubeck, Brian Cummings, and Nathan Medley were narrator and the voices of God/Jesus, swapping around roles. While I am not a huge fan of counter tenors as they can often sound brashy and forced, these three sang angelically and blended beautifully – helped along by Adams' polyphony which showed a great understanding of the voice. Here the hand jiving added substance to their performance even if it became a little umpa-lumpa-ish in places. Russell Thomas (no stranger to the part) played Lazarus, Mary and Martha's brother who was raised from the dead, but also sang other male roles including the narrator and Jesus. His smooth baritone fitted well with the ladies' vocal styles but it was sometimes confusing who he was. I suspect that this was a deliberate feature designed to blur the differential in time between biblical times and modernity. Lazarus was also performed by dancer Parinay Mehra, Jesus and the angel Gabriel by Banks, while Mary and Jesus' mother were Stephanie Berge and Ingrid Mackinnon. The dancers filled in other roles in the scenes such as the other prisoner, homeless people at the shelter, disciples, friends and family, and relationships were kept deliberately fuzzy. 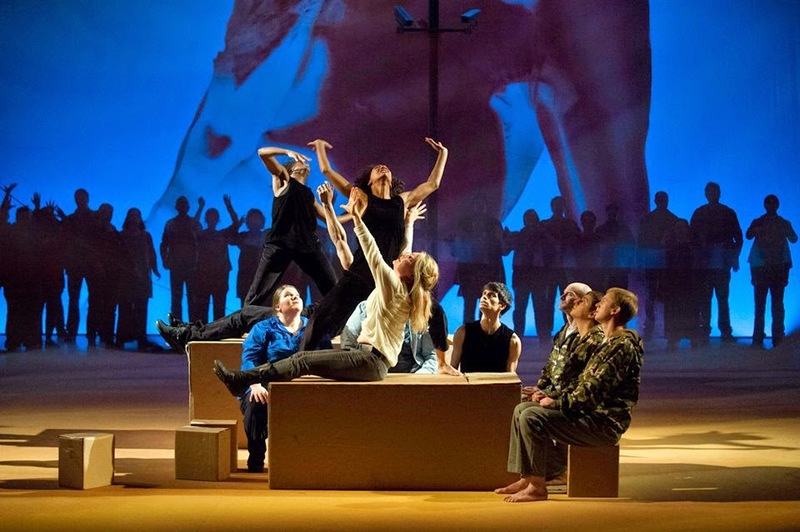 In some ways it was the dancing along with the scenery and clever use of boxes, that lifted this performance out of oratorio. The dance effect used for the resurrection of Lazarus was cinematic, and the street dancer Banks (James Davis) was mesmerising. Conductor Joana Carneiro in her first performance with the ENO was clear and strong in her direction of the orchestra and singers. The orchestra itself was expanded with exciting sounds including a whole row of cowbells and an unseen cymbalon/zither, which added a freshness to the proceedings. The music for the scene at Golgotha was particularly atmospheric with gnashing and wailing, and threatening bass, followed by a pertinent silence and descending strings. Very effective lighting threw shadows on the back wall adding to the air of menace. But for all that this was a passion play which assumes that the audience is in agreement with the biblical narrative. The modern texts by poets Rosario Castellanos, June Jordan and Louise Erdrich added a depth to the religious issues, looking at women's and worker's rights as well as issues with ethnicity and sexuality. Although Adams' and Sellars' interpretation was thoughtful there is only so much that can be addressed in a couple of hours. The general feeling at the end seems to be – well this is what is happening in the world... nothing has changed in 2000 years... what are you going to do about it?